Chinese President Xi Jinping met with German Chancellor Angela Merkel here on Tuesday and put forward a three-point proposal on the further development of China-Germany relations. The two leaders met on the sidelines of a global governance forum co-hosted by China and France. China-Germany practical cooperation has maintained a sound momentum of development despite an increase of volatility and uncertainty in the current international situation, Xi said. China was Germany's largest trading partner for a third consecutive year in 2018, with a nearly 140 percent increase in German companies' actual investment in China, he said. China, Xi told Merkel, has set its goals and ideas that it would continue to deepen reform, expand opening-up and promote high-quality economic development. Noting that China stands firm in sticking to opening-up, Xi said China is also sincere in advancing and expanding its cooperation with Germany and with the European Union (EU). China is willing to join efforts with Germany to continue to expand and consolidate the basis of China-Germany cooperation, so as to bring more benefits to the two peoples, he said. Recalling that Merkel has repeatedly expressed her firm belief in win-win cooperation, the president said China also considers joint cooperation, mutual benefits and win-win results the only right choice in resolving various global problems. Under the current circumstances, the significance of strengthening China-Germany and China-EU cooperation is beyond the bilateral scope, Xi said, putting forward a three-point proposal on the next-stage development of China-Germany ties. Firstly, the two countries should deepen their bilateral cooperation to set an example of win-win cooperation for the world, Xi said. Noting that China and Germany are not rivals nor adversaries, Xi said seeking win-win results through cooperation is the main thread in China-Germany ties, and urged the two sides to boost cooperation in such fields as artificial intelligence, automatic driving, new materials, new energy, life sciences and smart city. Xi said he hopes that Germany would create a friendly and open policy environment for Chinese enterprises to invest and develop in Germany. Secondly, the Chinese president proposed that the two countries take the lead in China-EU cooperation to inject more stability into the world. China sees Europe as an important force in promoting world multipolarization, and has always been a staunch supporter for Europe's path of unity and self-improvement, Xi said. With China and Europe being the world's two major forces of stability and two major economies, the steady growth of their relations conforms to the common interests of both sides, and is conducive to increasing stability in the complex and ever-changing world today, he said. China hopes that Germany would exert an important and positive influence on helping the EU to focus on cooperation and avoid disturbance, he added. Thirdly, the two countries should jointly advance global governance to safeguard multilateralism, Xi said. China is willing to work with Germany to uphold the international system with the United Nations at its core, he said, urging the two sides to enhance coordination within the framework of the Group of Twenty to make greater contributions to improving global economic governance. 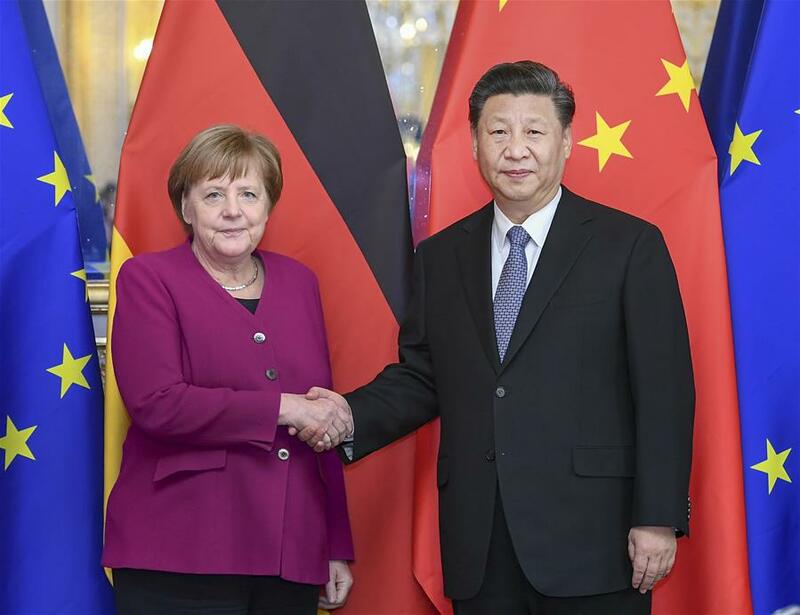 The Belt and Road Initiative is conducive to promoting international economic cooperation and building an open world economy, Xi told Merkel, pledging to expand third-party cooperation with the German side. Merkel said Germany and China share broad common interests, with sound development of bilateral ties in recent years, and close communication and cooperation at all levels and in various fields. Germany would like to deepen its economic and trade relations with China in the digital age, and is willing to actively participate in the second Belt and Road Forum for International Cooperation, Merkel said. Germany is looking forward to fully utilizing the market opportunities brought by China's further opening-up, and will provide a fair and favorable market environment for Chinese enterprises to invest and start business in Germany, she said. The chancellor noted that her country is committed to promoting EU-China cooperative relations and stands for joint efforts of the EU and China in safeguarding multilateralism. Xi arrived in Paris from the southern French city of Nice on Monday to continue his state visit to France. France is the final stop of Xi's three-nation Europe tour, which has already taken him to Italy and Monaco.